I have always loved Christmas. I was that goofy kid singing “Silent Night” during the Fourth of July fireworks, the one whose Christmas list was made by October 1. When I was eight, I hauled my dad’s huge Bible downstairs, pushed a few presents out of the way, and snuggled under the Christmas tree to read the story I already knew by heart. Just before Thanksgiving of 2004, we learned that we were finally—yay!—pregnant. We told our immediate families and started making plans. I strung lights, took extra care wrapping gifts, and placed the ornaments just so on the tree. Christmas was back and I’d been given the perfect gift. On December 24, I miscarried. We talked to the doctor; we underwent all of the usual medical tests. We prayed for our preborn baby, for ourselves, and for a healthy future pregnancy. A few months later, we started trying again. I turned 32. Just after Thanksgiving, the little stick in the pregnancy test kit turned pink, and a follow-up visit with our doctor confirmed I was pregnant again. This time, I miscarried on December 15. The heavens closed, my optimism sank, and everything turned grey—especially Christmas. How could I celebrate the birth of Christ when I couldn’t celebrate the birth of my own children? I was certain there was a problem and that the problem was me. God didn’t want me to have children. I talked to our minister, who assured me that God doesn’t work that way. Then he reminded me of the patience of Job. This wasn’t what I wanted to hear. Hadn’t I been patient enough? I’d waited patiently for three years to become pregnant, I’d been the perfect patient after the first miscarriage, I’d remained optimistic, and now I was being asked to be even more patient? To wait even longer? I stopped praying for a baby and tried to convince myself that, even if I didn’t have children, I could still have a full life. Two more Christmases came and went, and while my dread of the holidays didn’t increase, I still didn’t have that unfailing joy that the season used to bring me. That year (2007), just after the real Christmas rush began in December, my devotional reading was based on Ephesians 1:3–6: “Blessed be the God and Father of our Lord Jesus Christ, Who has blessed us in Christ … as He chose us in Him, before the foundation of the world… In love He destined us for adoption to Himself through Jesus Christ.” A few days later, our minister’s sermon was a different take on Christmas. Rather than Mary the Virgin Mother, he focused on Joseph—the man who chose to be a father, who adopted the Son of God as his own. Something clicked. Long before we decided to have biological children, we had talked about adopting a child too. We hadn’t talked about it recently. But during that sermon, my husband took my hand and squeezed it. I knew Kyle was thinking the same thing I was: God’s plan for us wasn’t a nine-month wait, but one that might be even longer. A few days later, I noticed a sign across the street from the post office: “Become a foster-adopt parent.” Without hesitating, I called the phone number on the sign and left a message. Just a few minutes after I arrived home, an employee of the state’s Division of Children’s Services called. DCS wanted to teach a new foster care and adoption class, and needed one more family to participate. Were we interested? We jumped at the chance. For the next 13 weeks, we attended sessions on foster care, the children and families in the foster care system, and what to expect from a placement. They didn’t sugarcoat the situation: Most of these children have severe problems, most won’t be available for adoption, and most of the children available for adoption are older. We didn’t care. We believed that God would bring us the child we were supposed to have—a child who was already our child, in His eyes and in our own. We became certified, finished our home study in late May 2008, and started our wait. Just one month later, we got a call. There was a newborn baby at the hospital. There was a chance she would be available for adoption—an ever-so-small-chance wrapped up in an ever-so-tiny package named Shelby. Shelby arrived in our lives four hours after we learned about her. She was born addicted to crack cocaine, with marijuana and alcohol also in her system. As a result, her tiny arms and legs tremored constantly. The first night, we awoke to her screams of pain at 1:00 a.m. The tremors went from semi-gentle to hard, pounding shakes that made me cry for our new baby. That first night we had no idea what to do for her, so we took turns holding her close, talking gently to her and reassuring her that it would be OK. We prayed for peace for our little one, for patience for ourselves, and for connection between all of us. At the pediatrician’s office the next day, we were told there’s no treatment for cocaine addiction in newborns. Had Shelby been born addicted to heroin, there were things they could have done, but in her case, we just had to wait. I didn’t accept that. A good friend showed me foot massage techniques she used in a chiropractor’s office. I figured there was nothing to lose. It took six weeks for the drugs to work their way out of her system, but after the first few days of foot rubs, the screams of pain stopped. Shelby didn’t crawl until she was nearly a year old and didn’t walk until she was 15 months old, but since then she’s done double duty to catch up. Today, she is a happy, healthy three-year-old with an amazing vocabulary, huge curiosity about the things around her, and the ability to make us laugh when we should be disciplining her. Despite the drugs and the slow foster-to-adopt system, from the minute I first held that five-pound bundle, I knew she was meant for us. My husband did, too. 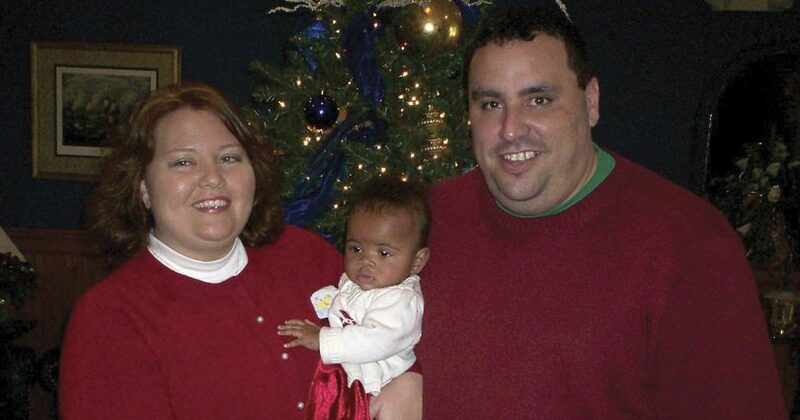 In all, the adoption process took almost 18 months, but on December 15, 2009, four years after our last miscarriage, we officially welcomed our daughter to the family. There are many things that make me sad about the way Shelby came into the world. But I’m forever grateful to her birth mother. She chose life for our daughter. Perhaps it wasn’t a conscious choice, but she allowed our child to grow in her belly for nine months—and that choice gave me the chance to be her mom. Kristina Knight is a freelance writer from Sandusky, Ohio. Her articles have appeared in Family Delegate magazine and online at www.AOL.com. You can contact her at kris[email protected].